One of the greatest challenges that individuals with special needs face is a lack of fitness programs and gyms. They are not provided with the necessary equipment or physical activity needed to maintain a healthy lifestyle. Thankfully, a new gym designed especially for individuals with disabilities has made its debut in Los Angeles, CA! 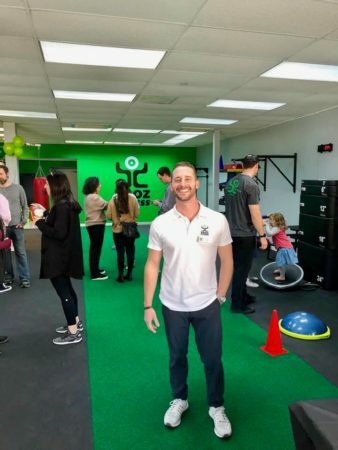 The ZOOZ Fitness studio in Encino opened its door on Sunday, March 10th. It is sure to make huge strides for the special needs community. We Rock the Spectrum is excited to support and welcome ZOOZ Fitness to SoCal! Most fitness programs and gyms are not set up to accommodate individuals with special needs. That’s where Jake Weiner stepped in. ZOOZ Fitness began when Jake noticed there was a great need for exercise opportunities for those that need an extra push or support. Many individuals with special needs are developing sedentary habits, gaining weight, and not participating in movement-related activities. With all of these factors in mind, Jake created a space where those with special needs could stay active and learn about the importance of movement in daily life. 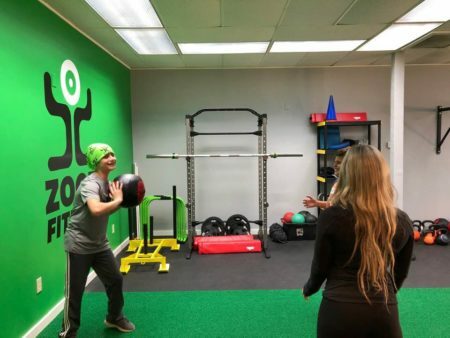 ZOOZ Fitness’ newest space is a 2,500 square foot training studio where opportunities are created and challenges are welcomed! This new training facility provides a space for our athletes to start new classes such as yoga, self-defense, and circuit style training. It also encourages confidence and builds strength! It is functional in its design. All the equipment can be moved around to better support each athlete that trains at the gym. It has rubber and turf flooring that provides a safe training surface. We Rock the Spectrum CEO & Founder, Dina Kimmel, attended the event along with her family. Dina met Jake at a resource fair over 4 years ago. After speaking with him and seeing the amazing work that he did, she insisted that he work with her son, Gabriel. Shortly after Gabriel began training with Jake, he immediately demonstrated improved gross motor skills and strength. “As I pulled up to this amazing space on Ventura and White Oak, my eyes filled with tears and I thought once again just how ‘meant to be’ life can be!” said Kimmel. We Rock the Spectrum is proud to support Jake and his amazing vision! 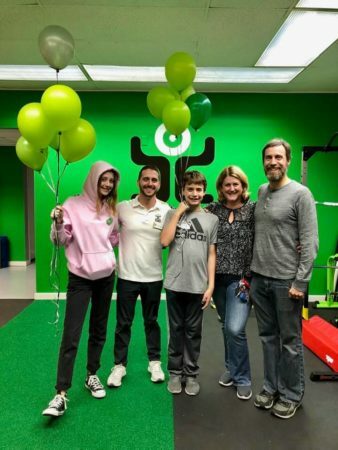 For more information on ZOOZ Fitness and the amazing things that Jake and his team are doing, you can visit their website at www.zoozfitness.com, or check out their Facebook.